Article Summary: Review of the Deadwood Stove. 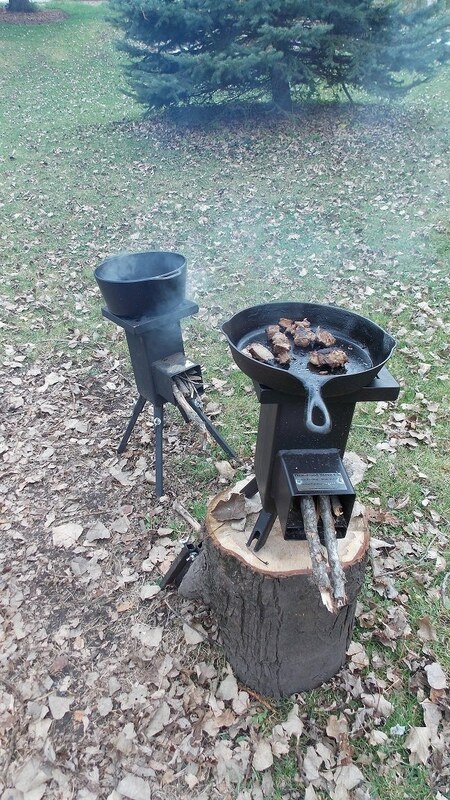 A fantastic biofuel, off grid cooking device. The grandkids come over and want to make s’mores. Even though I have a fire ring down by the creek it is a chore to start up a campfire for 10 minutes of roasted marshmallows and then they are off to something else. We have lots of tree–maple, birch and various spruce trees. We have branches come down in every storm and a lifetime supply of pine cones! So I have been looking at rocket stoves using biomass (sticks and pine cones), for perhaps two years now. Weighing the pros and cons and trying to decide what I really want from it. Did I say money was tight? Everything I purchase has to work for multiple purposes. If the power goes out and no natural gas is available, how am I going to cook? The propane grill will only work for so long and only for so much. But what if nothing ever happens? How can I use a rocket stove to justify the purchase? I NEED at least one extra burner on the deck near the grill. I could satisfy the grandkids with their s’mores and hotdogs without creating a bonfire, and the kids could gather the twigs needed to fire it—yard cleanup. It would definitely be handy for our camping excursions and would save us money by not having to buy firewood at the site (Minnesota is currently under a ban for unauthorized firewood being brought into parks due to an emerald ash borer infestation threat). And the kids could borrow it. 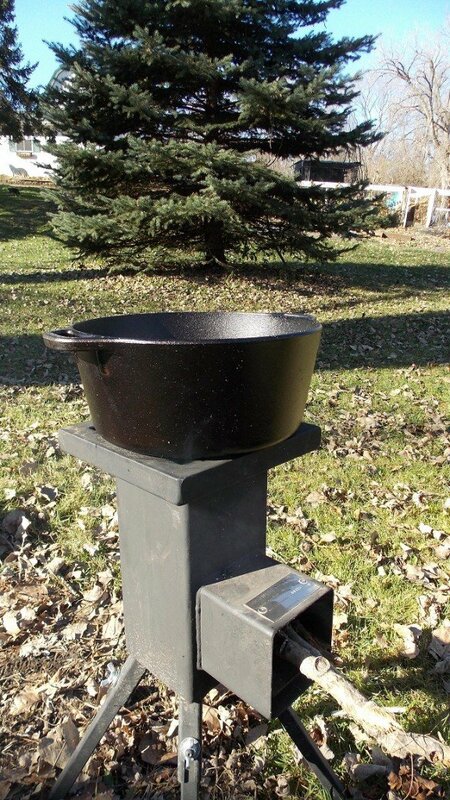 So, which rocket stove? After viewing many videos on YouTube, I decided to purchase the Deadwood Stove. Seemed like the best value for the money. And I can say that I am not disappointed! It arrived promptly and I was totally impressed with the quality, construction and good leather gloves that were included. I’m old and disabled, so weight is a concern for me. The Deadwood Stove is 18 lbs. Not light, but for the quality of construction it is made for durability—5 year warranty. This is a mini-woodstove–I’m guessing 50 years plus. The Deadwood Stove is something you can pass onto the kids. This makes the $250 I spent on my gas grill look like money ill-spent as that, even though it is stainless steel, is already rusting (1 year old!). I’ve had my Deadwood Stove for about six months now. I’m thrilled! With dry sticks and pinecones it boils a quart of water within 10 minutes. I keep one (Yes, I actually have two now!) on top of a table on the patio so I don’t have to bend over. It has removable legs, so it is perfect on a tabletop. The legs have a slight adjustability, so the other one on the edge of the deck (it is actually a limestone retaining wall so it is not a regular surface) can be easily leveled. Roasted marshmallows within three minutes! You can grill a steak (or tinfoil anything) to perfection directly on top of the built-in grill just by adjusting how many sticks you feed into the front of the stove. Talk about adjusting… Wind blowing the wrong way? Just turn it! Works best facing the sticks into the wind—no smoke! I put wood chips in a tin foil pan in my propane grill to get that delicious wood smoke flavor… Turn the Deadwood Stove slightly angled to the wind and you don’t need to add smoke! Actually, I’ve been contemplating how I can use a Deadwood to create a smoker. I’m sure it can be done; I just have to figure it out. 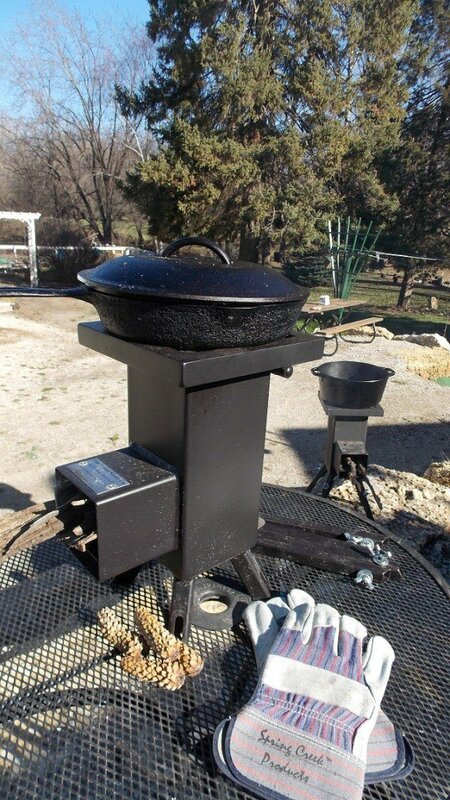 With two Deadwood Stoves you can pretty much do a meal. My two Deadwood Stoves have almost made the propane grill obsolete! And between we use them camping and the kids also using them, the savings in not buying firewood at state parks has already paid for both in one summer! Only problem… The kids! Expect that they will borrow one for every camping expedition. The son even uses it on his pontoon boat! And my husband takes it with him on his Harley when camping! And if two of the kids go camping at one time, well, you are sans your Deadwood Stoves. Not good if you get the grandkids. My son even sidled up and asked who was going to inherit the Deadwood’s! He already has dibs on the 12 gauge and .38! Not cheap, but worth the money! 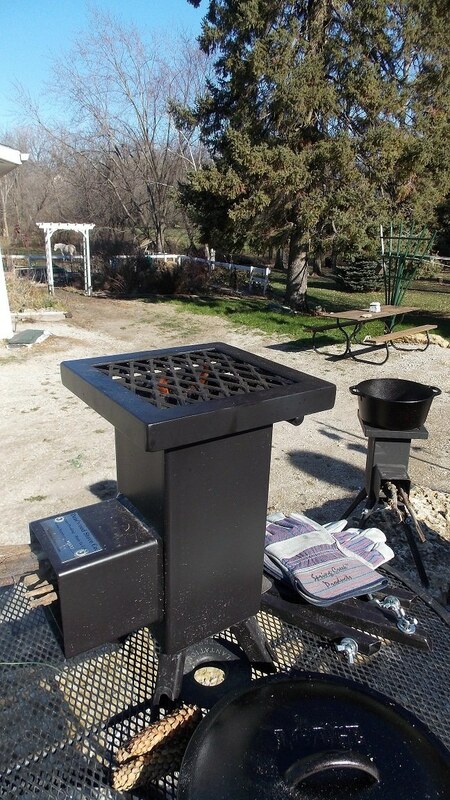 For more information visit the Deadwood Stove Company’s website.